This healthy dip gets a spicy kick from a fresh and dried pepper, without adding unnecessary sodium or fat to support your weight loss goals. Feta cheese provides the protein, olive oil provides the healthy fat, and the eggplant itself is great for skin health. 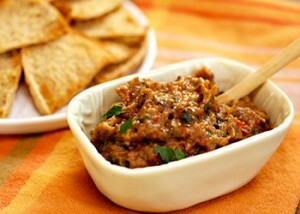 Serve as a side, with toasted pita, or as healthy sandwich spread as a delicious part of your Sleeve Gastrectomy diet. Place oven rack about in the second to lowest position and preheat broiler. Poke a few holes around the eggplant and place in broiler. Turn the eggplant with tongs every 5 minutes, until the skin is charred and the flesh soft enough to easily poke into with a knife, 14 to 18 minutes. Toss the eggplant in a medium bowl with the lemon juice to help prevent discoloring. Stir in feta, onion, bell pepper, chile pepper (if using), basil, parsley, cayenne and salt. Taste and add agave if the flavor is bitter. Dr. Kahlil Shillingford is a board certified surgeon who specializes in bariatric or weight loss surgery including the Sleeve Gastrectomy (Gastric Sleeve), Gastric Bypass, and Lap-Band procedures. His patients come from across the state of Florida including Port St. Lucie, Orlando, Tampa, Miami, Fort Lauderdale. To learn more about Dr. Shillingford’s integrative weight loss surgeries and all-inclusive fees please call his office in Boca Raton, Florida at (561) 483-8840.